This is perhaps a bright new era for the double-decker Airbus A380 jet aircraft as the first 'second hand' example starts its operational life with a new operator. 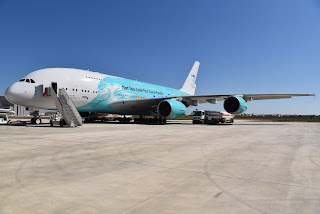 Hi fly, is the European wide-body wet lease specialists, flying an all-Airbus fleet and are now the new operators of an Airbus A380 that previously flew with Singapore Airlines for 10 years. It is the first of the type to enter 'second hand' service and makes the start of a new era for Airbus and the A380 programme. After discussions with the lessor and potential customers, a deal came together with the highly regarded Hi fly, a true specialist in aircraft, crew, maintenance and insurance (ACMI) or ‘wet lease’ operations. Hi fly lease out aircraft to airlines when that airline's aircraft are grounded for any number of reasons, such as maintenance checks, late deliveries of new craft, technical hiccups and so on. Hi fly literally fly in and take up the role that the airline's normal aircraft would have done. The leasing airline has none of the worries over crewing it, insuring it or maintaining it as this is all done by Hi Fly. 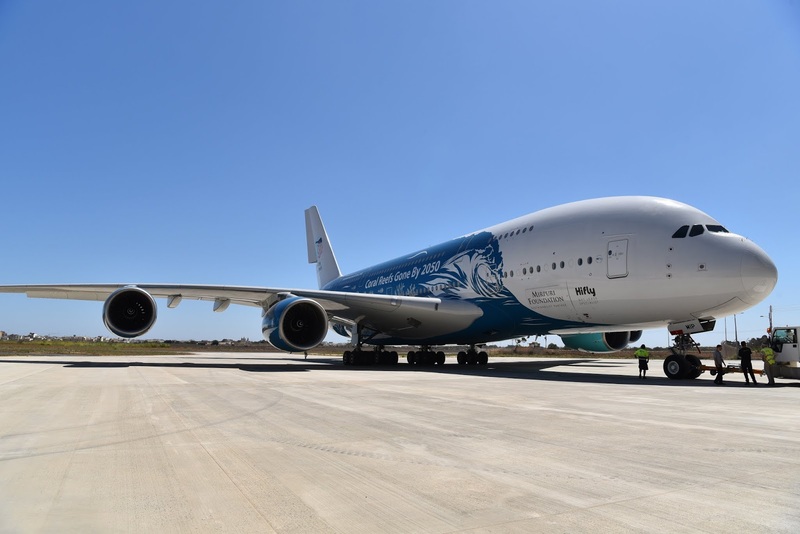 Hi fly President and CEO Paulo Mirpuri said: "We welcome the arrival of the Airbus A380 in our fleet and we are extremely happy with the market reaction so far on this new availability in our wet lease product offering.” He also praised the aircraft’s comfort and environmental performance. One of the most striking things about Hi fly's A380, other than its sheer size, is the wonderful colour scheme the airline has painted on the big double decked bird. 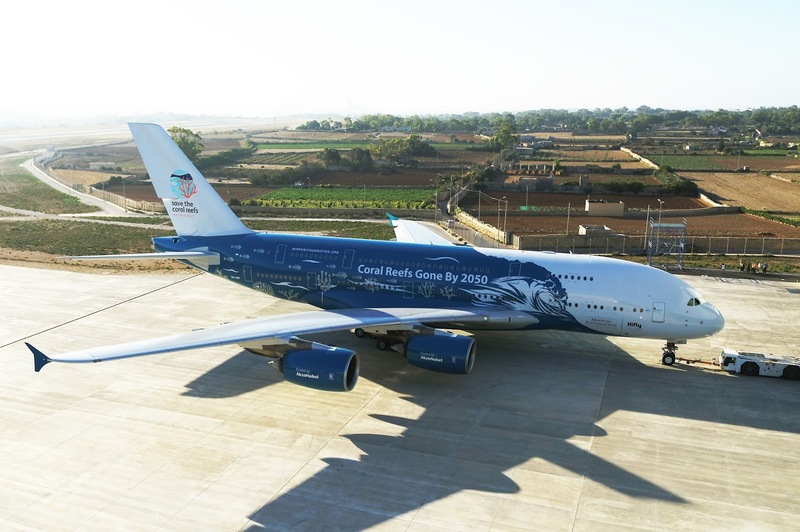 Rather than leave it white, with just a few name decals, Hi fly has shown support for the Mirpuri Foundation campaign “Save the Coral Reefs” by painting the A380 with a special-themed livery, promoting the conservation message to the world. 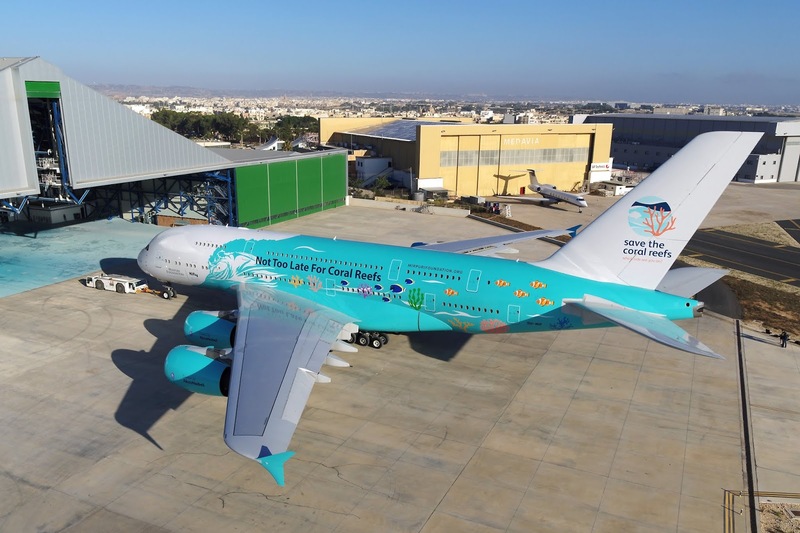 The aircraft unusually has different colours prominent on each side, one is in dark blue displaying destroyed corals that contrasts with a light blue side representing a pristine ocean with colourful and healthy marine life. “A big cause requires a big answer and now, the biggest commercial aircraft on the planet will be the one carrying this big message around the globe”, Paulo Mirpuri said. With this initiative, Hi fly is raising awareness for this unprecedented campaign to fight the destruction of coral reefs. If no action is taken, these beautiful ecosystems will disappear by 2050. With 50% of the world’s corals already gone, action needs to be taken immediately and awareness is the first step. Hi Fly have kept the seats and configuration of its former operator Singapore Airlines, so the craft currently features 471 seats in a three-class layout that is both spacious and attractive. 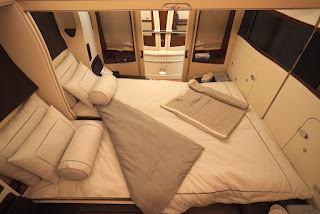 On the main deck, there are the 12 first class seats, which really are mini-suites, two in the middle and one either side of the twin aisles, the ones in the middle can even be converted into a double bed - the others just convert into a fully lie-flat bed! Completing the rest of the main deck are seats for 311 passengers in a standard economy cabin in a 3-4-3 layout. 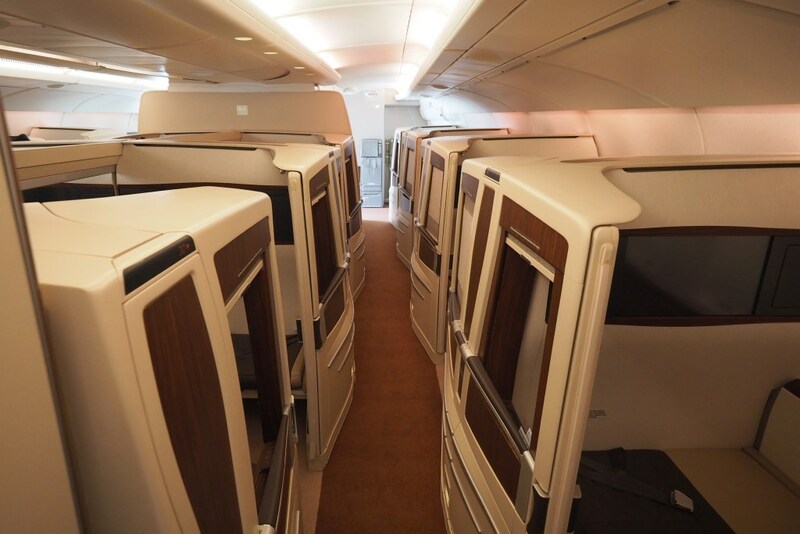 The upper deck is split between 60 Business class in a 1-2-1 layout and 88 Economy seats in a 2-4-2 configuration. The business class seats are wide and comfortable and can also be converted to a flatbed for those long overnight flights. You can see a full tour of Hi Fly's A380 at The Points Guy. 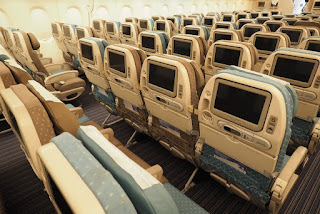 As you would expect from a former Singapore Airlines aircraft, all seats have an in-flight entertainment system to keep you entertained, which has been retained by Hi Fly for its operations. Although, if a customer wanted, Hi Fly says the aircraft could carry 853 passengers in a high-density configuration and all powered by four of the most reliable engines in the world, the Rolls Royce Trent 900. 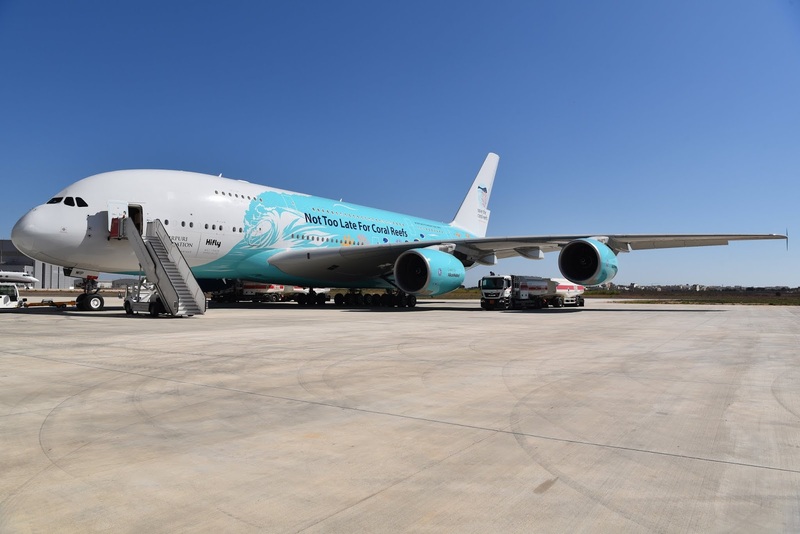 Which airlines will wet lease the A380 from Hi Fly remains to be seen, however, the company has recently operated flights for the likes of Air New Zealand, Thomas Cook, Nepal Airlines, XL Airways France, Arik Air, and Norwegian. This list and the number of A380 each airline has in operation was valid at the start of July 2018.